Lake Oswego Fire Department Engineer Russ Thackery was able to provide emergency medical assistance to a fellow passenger on a plane flight in April. Thackery was heading home from Mexico aboard Alaska Airlines Flight 293 on April 16 when a passenger on the plane passed out and was helped to the floor. Thackery was in the rear of the plane when a flight attendant asked if any medically trained passengers were aboard. "We were just taking off from Cabo San Lucas," Thackery told The Review. "Somebody had a medical emergency as soon as we reached cruising altitude and the seatbelt sign came off. A 42-year-old male went to the restroom — he'd been sick for a couple of days — and he got up to walk back to his seat and passed out." After informing the flight crew that he was a certified paramedic, Thackery rushed to the front of the plane along with another passenger, who happened to be a surgeon, and they began rendering aid to the unconscious passenger. The man's pulse was weak but regular, Thackery says, and between that and the information provided by some of the man's friends on the flight, they concluded that the culprit was most likely dehydration. They positioned the man's knees above his heart to increase blood flow to his head, which enabled him to regain consciousness. Once awake, the passenger was immediately alert and able to coherently answer questions, Thackery said, which further indicated that the incident was likely caused by dehydration rather than something else, like a seizure. They began slowly giving the passenger water, and he was gradually able to first sit up and then eventually return to his seat. "Once it was determined that he wasn't having a life-threatening emergency, we just hung out with him a little while longer and got him comfortable, and continued with the flight," Thackery said. Not only did Thackery step up at a time of crisis, but the quick diagnosis allowed the plane to continue to its destination without having to divert to the nearest airport. "While I was (taking his pulse), the surgeon started talking to flight control," he said. "They were talking about diverting at first, but we were able to convince them to continue with the flight." This isn't the first time Thackery has made the news for providing emergency medical assistance while off duty. In September 2015, while at a restaurant with his family in Ocean Park, Wash., Thackery overheard a conversation in which a fellow customer realized that she had unknowingly eaten mushrooms that were in a steak sauce. The woman went into anaphylactic shock shortly thereafter, turning blue in the face and struggling to breathe. Thackery recognized the symptoms and asked the surrounding bystanders if any of them had an EpiPen, an epinephrine auto injector that is used to reverse allergy attacks. Two people said they had EpiPens in their cars, and Thackery told one of them to run and retrieve it while he coached the woman on her breathing. When the bystander returned, Thackery checked the EpiPen expiration date and then administered the shot. He started to prepare a second dose, but the woman quickly began to stabilize. 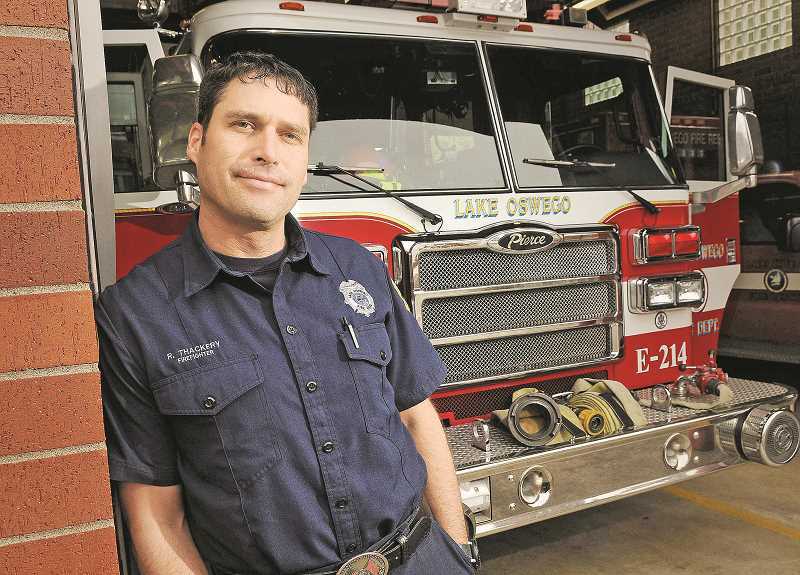 Thackery has been a firefighter for more than two decades, including 12 years with the Lake Oswego Fire Department.